All Author proceeds will be donated to the MyGoodPoints.org charity. Jobs are key to Ireland’s economic recovery. And while the multinational sector continues to grow and develop, the focus is shifting to indigenous Irish companies, especially those with the capability to scale and grow internationally. As a serial entrepreneur known globally in the Telecoms industry as a thought leader for innovation and strategy, Brendan Dowling shares practical advice and stories based on his own experience - whether that’s starting out selling mushrooms as a student in UCC or taking on the big guns like Polo, Boss and YSL with his premium aftershave company – in his groundbreaking book, ACCELERATING COMPANY GROWTH: A Practical Guide for CEOs. According to Brendan, “One of my overriding reasons for writing this book was the fact that I received very little practical advice myself as I started and grew my own businesses. I did not have a mentor or coach and practical books with real business advice were hard to come by. ACCELERATING COMPANY GROWTH will help any CEO to grow their business beyond what they would have achieved on their own. “For the cover, I chose an image of a racing yacht in full sail, capturing the power of the wind and crashing through waves, as it accelerates through the ocean. This is the best representation of what it is like to accelerate company growth. To go this fast, you need to have a great team who know what they are doing and who work in perfect harmony, under the leadership of a great captain, who makes the right decisions on what direction to go and the sails to use for the wind conditions, currents, waves and all the other elements that are thrown at you by the unpredictable environment. When you get everything right, the excitement and adrenalin rush that comes from the acceleration, as you ride and crash through waves under your own power, is invigorating – just like accelerating the growth of your company”. Section 1 covers the pre-requisites for accelerating company growth: motivation, leadership, vision and strategy. Section 2 covers the key areas that drive company growth, giving you advice and tips from Brendan’s own experience: your elevator pitch; value proposition; market; the customer’s problem and your solution; marketing; sales; business model; competitors; team/people; finances; and operations. At the end of each of these chapters, Brendan shows how to complete a slide for your Accelerated Growth Plan that covers all the points critical to having a document that forms the blueprint for your company’s growth. Section 3 looks at other topics that are important contributors to accelerated company growth: how to use your board of directors; working with venture capital funding; selling your company; and business ethics. Appendix 1 includes a slide deck template that you can use to form the basis of your own Accelerated Growth Plan, while Appendix 2 shows a sample slide deck for a fictitious company, Nautique2 – based on Brendan’s first business, Nautique, as if he were starting it again from scratch today. All author proceeds go to MyGoodPoints.org, a new online charity based out of Ireland, which Brendan chairs. An account with MyGoodPoints lets you donate to a global network of charity projects, while charity workers keep you updated on how your projects are going with amazing videos, inspiring photos and letters of thanks. 9 What Problem Do You Solve for Your Customers? 12 How Do You Make Money? 13 How Do You Beat the Competition? ACCELERATING COMPANY GROWTH is a great chunk of advice and structural help. If you only buy one business book this spring, make it this. ACCELERATING COMPANY GROWTH is a brief and to-the-point cookbook for constructing a growth plan for your business. It’s filled with concrete and succinct stories that provide practical advice and encouragement for the aspiring entrepreneur. Brendan’s book is a welcome addition to the subject of accelerating business growth. The richness of his own experience provides great credibility and also gives very practical information that will motivate those who are on this path. It is also a compelling read! The book offers hard-earned and valuable advice to entrepreneurs on issues that they and their companies will face on a rapid growth trajectory. It is accessible and short – and repeated reading will reveal its many nuggets of wisdom. This is a comprehensive book that includes all the elements to building a robust plan for accelerating growth. It is very practical and written from Brendan’s wide experience rather than an academic perspective. 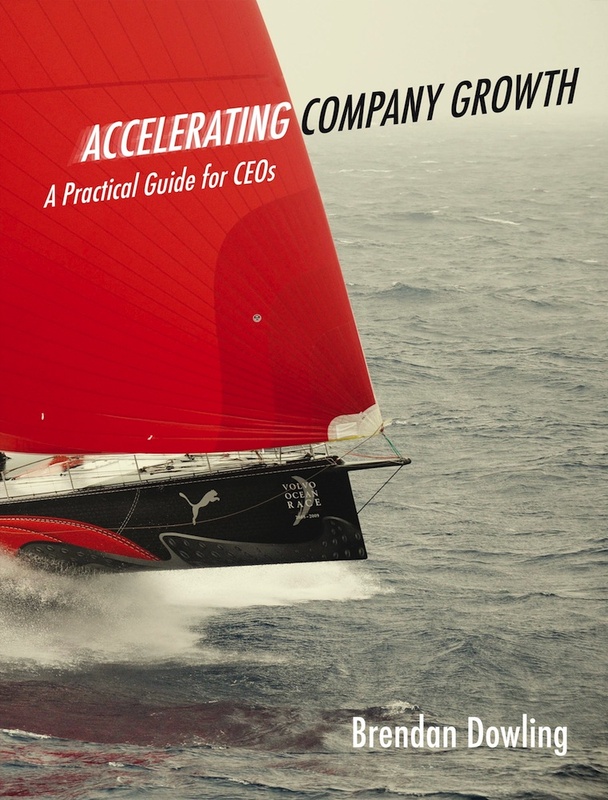 A very easy-to-read approach, with an easy-to-use framework, for CEOs wanting to understand the key elements involved in accelerating the growth of their business. Brendan has first-hand experience and is a natural storyteller. People who manage growing businesses are among the busiest around. They don’t have time to read many books, but they should read this one. Brendan Dowling has distilled many really valuable insights from his varied and successful entrepreneurial career. The advice he offers on how to grow a business is supported throughout by examples from his own experience. The book is not only a pleasure to read, but is structured in a way that makes it a valuable reference work as key growth challenges arise. This book by an Irish serial entrepreneur is intended to give practical advice to chief executives about how to grow their businesses. It starts by covering the prerequisites for growth that include motivation, leadership, vision and strategy. Unless you get those right nothing will help you achieve the growth you desire, he says. It then covers the key areas that drive growth and includes advice on elevator pitches, value propositions and the customer’s problem and your solution. Then he shows how to create an accelerated growth plan. Motivation is the foundation on which all business acceleration is based, he says. If you don’t have this or if it is waning, you should hire a business coach who will help you to try to understand what makes your business tick, what you want to succeed and why. Money is not a great motivator, he says, adding that his biggest business failure came from setting up a business in the plant hire sector, purely because he saw a friend make a lot of money from it and he believed it would do the same. It cost him a lot of money and it failed because he didn’t have the motivation to get passionate about it, he says. 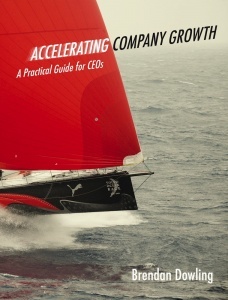 ACCELERATING COMPANY GROWTH is a real page-turner: a compelling and inspiring introduction to the complex field of SME acceleration. Brendan Dowling engagingly combines anecdote and analysis in refracting through the sympathetic lens of his own varied experience much of the research into successful entrepreneurship of the past dozen years. Key concepts from the elevator pitch to the value proposition are succinctly explained through examples that fit together in a clear, modular way. Jargon is judiciously deployed where it illuminates central concepts entrepreneurs are likely to encounter negotiating with investors (business model, red ocean), and considerable emphasis is rightly placed on sales and marketing. Above all, the author never loses sight of the human motivation and social potential of growth entrepreneurship. I read it on a long flight and didn’t notice the hours roll by. A book I wish I’d encountered years ago.